Crystal king prawns (玻璃大蝦球) - definitely one of the best versions in town that I've had. These prawns were simply huge... and the texture was very nice. Enough bite here but without being too crunchy - as is the case when the chef takes baking soda to them. Traditional Buddha jumps over the wall (古法佛跳牆) - now THIS was the reason for our gathering tonight. Our friend had raved about the Buddha jumps over the wall (佛跳牆) here, apparently made the traditional way as a stew instead of a soup. That left us salivating as we heard his description... Of course, we asked that the chef leave out shark's fin - traditionally one of the key ingredients in luxury versions. So each of us got an abalone, along with spiny sea cucumber, fish maw, pig tendons, goose web, pork belly, along with bamboo shoots. Everything, and I meant everything, was nice and soft and delicious... from the abalone to the sea cucumber to the goose web... and especially the pork belly - as the skin had been deep-fried to a crunch before braising. Double-boiled winter melon soup with shrimps, Yunnan ham, fresh crab meat and lotus seeds (原個燉冬瓜盅) - after having our luxury stew with rich and heavy flavors, it was time to balance things out with a very clear soup. The winter gourd helps to cool down our body's constitution, so it's perfect for warm weather. Love this soup... so clear with a huge chunk of winter gourd... along with some Tonkin jasmine (夜香花). Steamed sole (清蒸海方利) - the standard fish on the menu here, and we had two of them for the 14 of us. Our resident fisherman's friend did not manage to get us a wild yellow croaker, so we were unable to BYOF (bring your own fish) in addition to BYOB and BYOM... Oh well! The piece of flesh I got from the body was not over-steamed, for once. Crispy chicken (脆皮炸子雞) - I think the Chicken Fiend was pretty happy tonight as she got to pack some of this chicken home... although we did end up eating a little more than usual. Sweet and sour pork with pineapple (菠蘿古老肉) - this dish seems to be popping up in my diet more and more these days... but I'm not complaining tonight! The 肉眼筋 was very, very nice. Chinese cabbage with Yunnan ham (雲腿津白菜) - as usual, the veggie dish here takes much more skill than its name implies. The finely chopped Chinese cabbage (which doesn't come from Tianjin, despite its Chinese name 天津白菜) was deliciously flavored with ground ham, and of course cooked with superior stock. Steamed fragrant rice in lotus leaf (飄香荷葉飯) - this was very, very good... too bad we were all pretty full by now and unable to make too much of a dent in this. These were made in very limited quantities last year and given out to friends and a small circle of the media. That was one of the few times I dearly wished that I, too, could be considered to be from the media... so I could get my hands on these. I was insanely jealous of some of my friends last year. But tonight I got to have a taste, and this was very, very yum. As I actually don't like yolk in my mooncake, I purposely chose wedges which contained the least amount of yolk. Just that smooth and sweet lotus seed paste (and some Indian almonds) would do just fine! Double-boiled ginkgo nuts and lotus seeds (銀杏燉湘蓮) - a sweet way to finish our sumptuous dinner. Given there were 14 of us, I figured single bottles of wine may not suffice, so I encouraged people to bring either magnums or two bottles of the same wine. We had a very good evening in terms of wine, too! Jacques Selosse Initial, dégorgée a 21 Octobre 2014 - toast nose, nice and yeasty, a little mineral and savory. Nose was really fragrant. Good acidity here, too, with a full body. 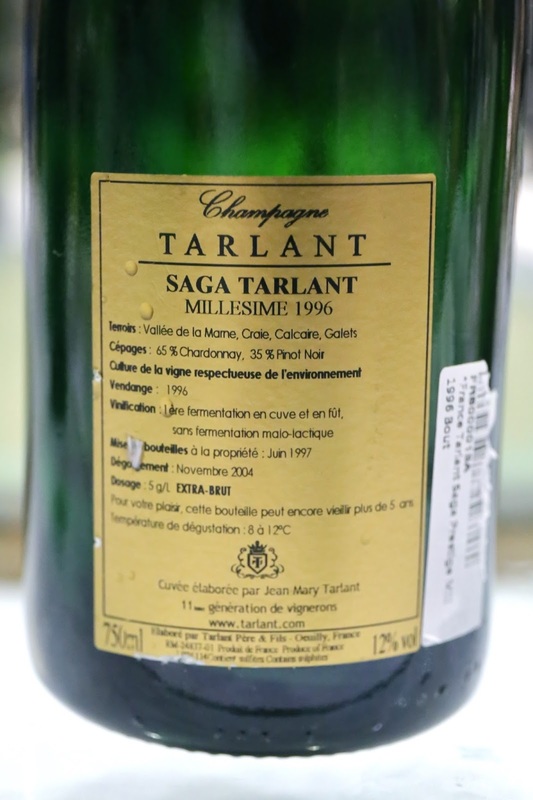 1996 Tarlant Saga Extra Brut, dégorgée en Novembre 2004 - very caramelized and sweet on the palate, with a little salty plum. Beautiful wine, and right up my alley. 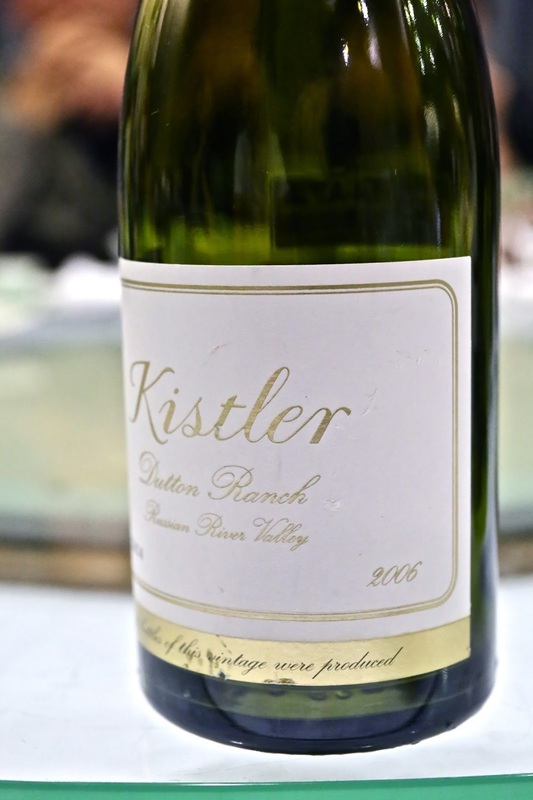 2006 Kistler Chardonnay Dutton Ranch - buttery, a bit toasty later. Medium-bodied but later on turned full-bodied with orange marmalade on the palate and a long finish. 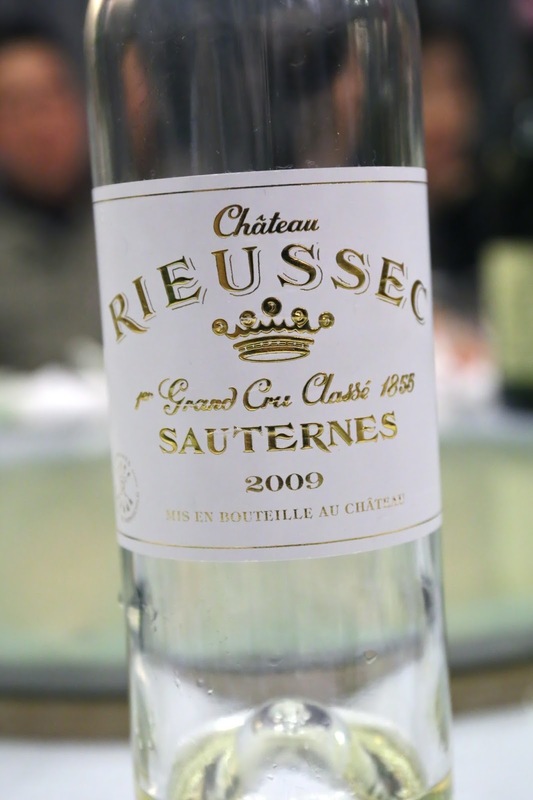 2009 Rieussec - lots of honey, nutty notes, orange blossom, and polyurethane. Nice and viscous. Very successfully paired with the Buddha jumps over the wall, at the suggestion of its contributor and our resident wine expert. 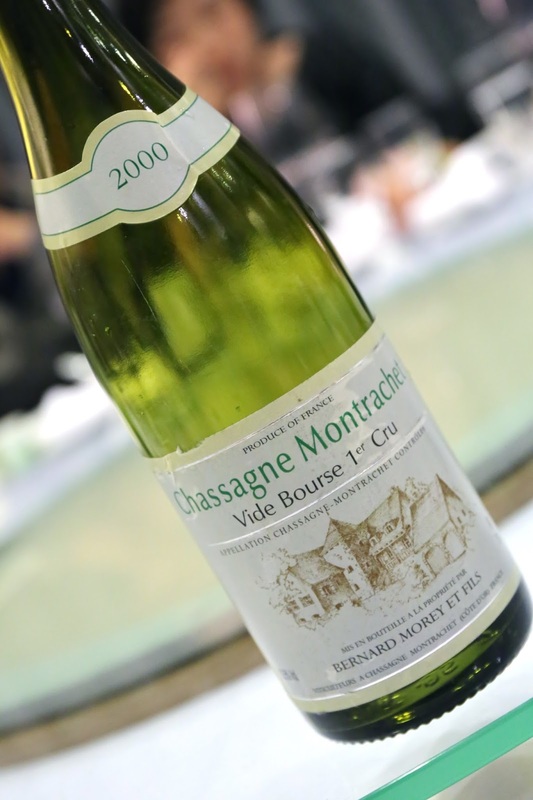 2000 Bernard Morey Chassagne-Montrachet 1er Cru Vide Bourse - nice and toasty nose, very open. Slightly sweet on the palate. Yum. 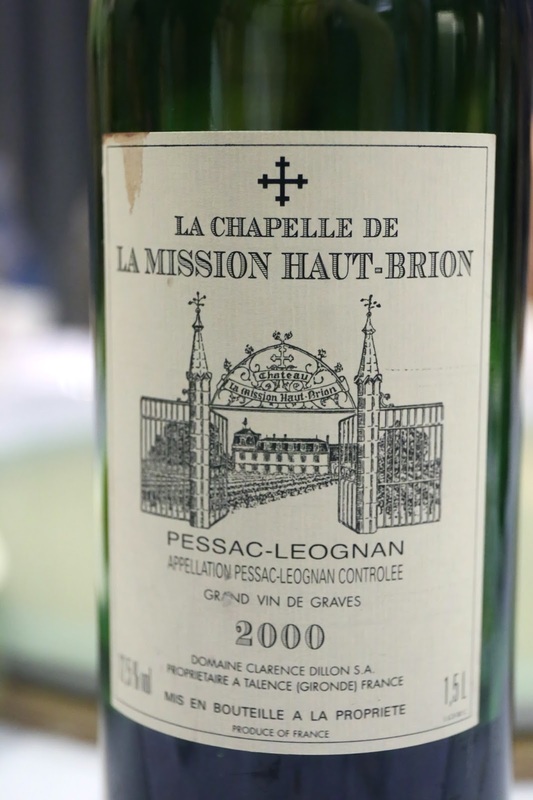 2000 La Chapelle de la Mission, en magnum - decanted 2½ hours and poured back into the bottom 2 hours before drinking. Definitely notes of leather, with a little smoke, and pencil lead. Nice fruit showed up once it opened up more. Later on the nose was much more smoky with a little black pepper. Very smooth on the palate and definitely drinking as it should. 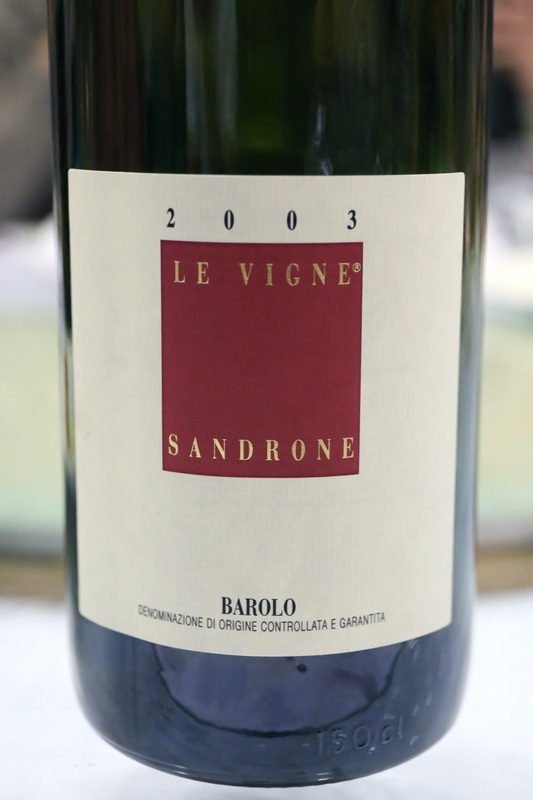 2003 Sandrone Barolo Le Vigne, from magnum - more alcoholic and sharper on the nose, with black fruits and ripeness on the nose. Still tannic on the palate, which wasn't surprising. 2005 Weinbach Pinot Gris Altenbourg Quintessence de Grains Nobles Cuvée d'Or - so much honey here, floral, orange blossoms. Nice acidity in the nose, too. Just so beautiful and rich and unctuous.